Yesterday the Wisconsin State Journal and other outlets posted a story from the AP about a law in Wisconsin that, among other things, limits restaurants’ ability to serve margarine in place of butter. The news story gives a short overview of margarine’s legal history here in the Dairy State. The statute is currently making headlines because a state senator wants to undo it as a silly restriction on business. True enough, but the article reports that even the Wisconsin Restaurant Association admits the law is essentially a non-issue. Given the challenges we’re facing as a state, I’m not sure this is a problem crying out for a solution right now. 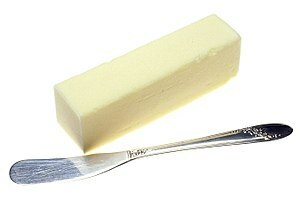 That said, the butter–margarine story is a fascinating one. For a more in-depth look at the “oleo wars” in Wisconsin and the nation over the last 140 years, check out this great article (click here for the PDF) by Gerry Strey, which appeared in the Wisconsin Magazine of History. It documents the battle between dairy producers and the makers of oleo, the public and behind-the-scenes efforts of politicians and industry lobbyists on both sides, and the cultural and economic shifts that influenced consumer attitudes and behavior over the years. It’s amazing to realize how long manufacturers (of butter, margarine, and everything else) have been trying to sell us their food products using health claims.